T’was the game before Christmas, when all through the ground, Not a player was stirring, not even a ball. The kits were hanging in the dressing room with care, In hopes that three points would be had by five to five tonight. The players were nestled altogether in the dressing room, While visions of scoring twenty yard shots went through their heads. And Dos in his gilet, Had given a rousing talk to get the team ready. When out on the lawn through the tunnel to applause and Sutton clappers, The supporters sprang from their seats in anticipation. Away to the centre circle they like a flash, And witnessed the coin toss to see who would win the kick off. "This Nun goes into a bar...."
The ball on the spot ready for the game to start, Gave the crowd a chance to remember a beacon of the Sutton United support. When, what to my wondering eyes should appear, But a goal for Tranmere in the opening minutes. With a little old swing up field so lively and quick, I knew in a moment it must be Kenny D. More rapid than eagles his coursers they came, He dived to head the ball into the net and the supporters cheered! "Now, JC! now, Bailey! now, Walton and Easty! On, Wrighty! On, Davis! on, Ross and Dundo! To the top of the table! to the top of the league! Now come on Sutton, come on Sutton, win the game". As going to bar before half time, When I meet with a beer, mounted to the table. So up to the other end before half time Tranmere score, With the half time team talk to come. And then, as the bell sounded for the second half, The passing and sprinting of each little move. As I drew in my head, and was turning around, I had a feeling a loss was coming with a bound. They (Tranmere) dressed in Roma style, And their third goal hitting the net. A bundle of three points on their shoulders, Going back to Merseyside, (well The Wirral to be correct). "...so I said to the Policeman...."
Our eyes how they didn’t twinkle, how the drinks would be merry! It was to await the next Strikers are Key draw. AB and accordion in hand, and tune in tow, And the velvet bags ready to draw out a lucky number for someone in the bar. The attempt at opening the safe not been made, And the festivities of Christmas drinks starting to flow. It was brandy o’clock for yours truly, That started to flow better after an earlier three course lunch! Chesney Hawkes is a right jolly old elf, And I laughed when I saw he is number in delight to myself! A tweet to him and a second from Malcolm, Soon will give Chesney a Happy Christmas with nothing to dread. I sprang to my feet with Taz and JR, And away we flew to West Sutton station. To I then exclaim to them and to our loyal readers, Happy Christmas to all, and to all a good-night. Ok I hope you all enjoyed that little festive effort. Which is of course my take on the well known 'Night Before Christmas' poem. Although I must apologise to Clement Clarke Moore for any offence in 'amending' his fine prose! 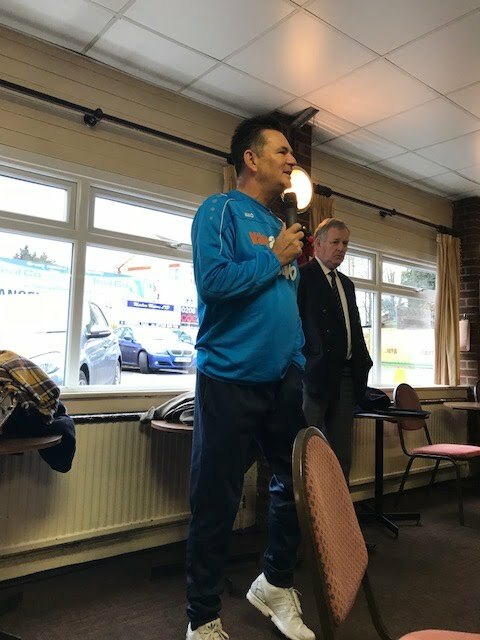 Before the game I went to the pre-match Christmas lunch and was treated to an excellent three course meal. I truly recommend anyone to sample it. However, do expect to be wishing to go home and sleep it off after rather than watch football, as I truly felt bloated for the remainder of the day. 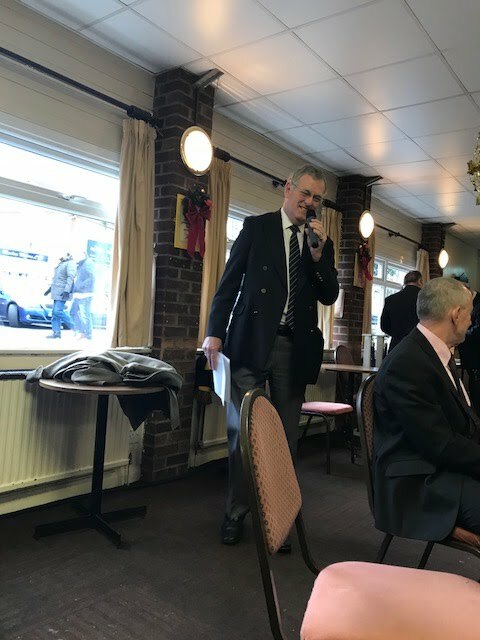 In between each of the courses we were treated to speeches by our Dos and our very own Bruce, as well as a Christmas quiz conducted by Joycey – a nod to our Treasurer Oakesy for suggesting this for the blog. It’s fair to say one table forgot to put their table number on their paper and when asked how many they got, they of course said they got every single question correct. However, in a tie break scenario they were defeated – the question how many career titles has the darter Phil “The Power” Taylor won. I can tweet you the answer, it’s more than you think! And no Googling! Upon leaving the meal, I take a Gander (see what I did there) at the team and it’s fair to say it’s lacking a lot of width. On heading outside it appeared a good crowd just two days before Christmas, as the teams walk out and shake hands there is a poignant moment with a minute’s silence for the passing of Barbara Tickle. I did not know the lady personally, but from what I have heard and read see was a much beloved member of the Sutton United family and my condolences go to her family and her friends. Now let me start by saying this game was not segregated (for some reason) and what is normally customary in these situations is for the Collingwood end to have Sutton supporters in it, but also most of the travelling support has camped out here also. Now this lot do not move at kick off and what starts to unravel is a stand-off between the two sets of fans which inevitably turns a bit sour when Tranmere to take the lead on 10 minutes. The lead lasts only around 15 minutes, Fatty Five of Tranmere heading the ball for a throw, which is given to Tommy Wright to cross the ball to the far post, where it's nodded back by JC for Kenny Davis to dive head the ball into the net. 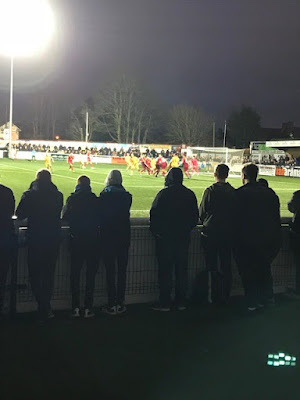 Now what should be a moment of celebration for us fans turns even sourer as things kick off a little and it eventually ends in Sutton fans being moved on and the match being belatedly 'segregated', hey it should have been from the very start. One Tranmere walks past to exclaim that Sutton is a (annotated) hole he wants to go home, well go home you are not wanted here with your boozy moronic attitude! This really angers me and it’s time to head to the bar with half time Steve. As we settle down drinking, well I could barely drink my beer as I am still bloated from the meal, we hear the bad news that Tranmere have scored one minute before half time, what a drag! But I take the advice from both half time Steve and Natalie to not let what has gone on affect me and they are right – thank you both. 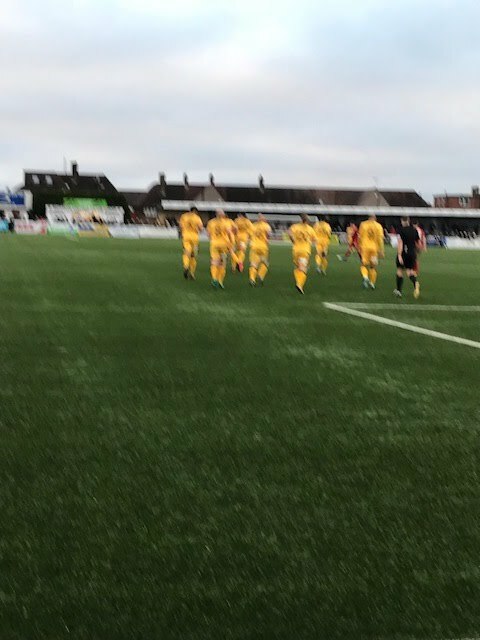 The second half for the U’s did not properly get going until the 56th minute seeing the introduction of Tom Bolarinwa on for Easty and at last some wing play was in force. This almost instantly produced an equaliser as a combination of Bolarinwa and Kieron Cadogan (on for Ross Lafayette on 63 minutes) crossing low for Tommy Wright whose shot was blocked and the follow up blazed over by Cadogan. With 15 minutes to go a returning Adam Coombes came on for Simon Downer, and this also produced an immediate effect too with a six yard box scramble leading to a shot grazing the post to out of play. It was with five minutes to go I thought enough is enough and its time to hear to the bar for a brandy – I also missed a third Tranmere goal right at the death in what was a disappointing result on the pitch to an attendance of 2237. Although we had moved down the table to fourth, none of the top seven winning is a bit of a small comfort. For the statisticians on the yellow card front, yellow cards were displayed to Walton, Downer, JC and Eastmond. Upon drinking my first brandy of the evening I stand with Leanne when our Chesney hits the jukebox - what a tune! This is followed by two Strikers are Key draws, the first for a season ticket which is won coincidentally by the Mersey Branch, I am not too sure who was drawn second in the money safe draw but I do not think it was won. Maybe the Editor can help here!? (Prize was not won - Ed). 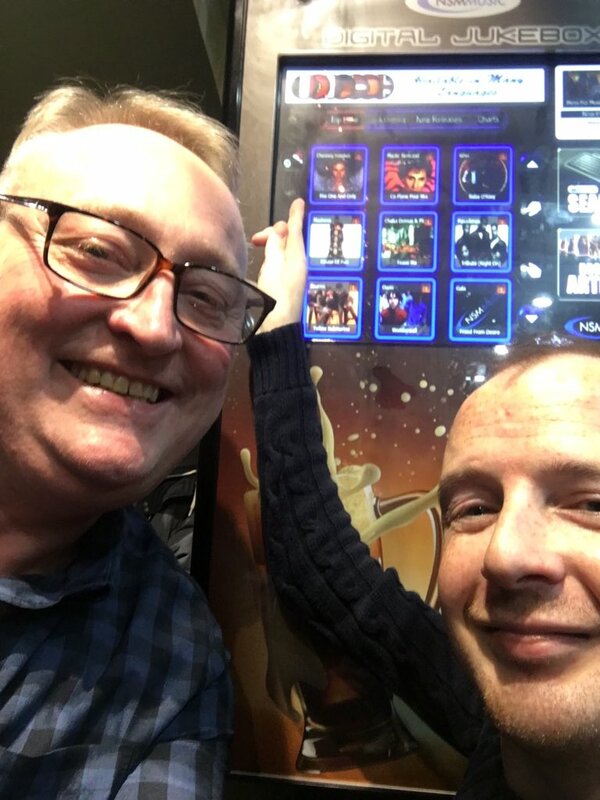 It’s time to head to the jukebox for my choices and to my amazement I spot that Chesney Hawkes is now the top played song, Malcolm (safely does it) and I tweet Chesney to declare this great piece of news with a selfie by the jukebox. Although, it comes to my knowledge Chesney is not well liked, but if you really listen to the lyrics it is a song of empowerment and inspiration – and hey no one can be myself like I can, for this job I’m the best man – I am who I am! After a few brandies just Taz, JR and I remain and we decide to get the train back to Sutton and whilst JR and I slowly stroll it, still bloated from the meal, Taz catches us up and upon arrival on the other side of the loop, we depart one another with the usual greetings of the season and thoughts now turn to the important business of Boxing Day. So I would like to wish all of our loyal readers, the Sutton United management, players, directors and other fans a very Happy Christmas and best wishes for 2018. What would be nice is a promotion push and a trip to Wembley for the Trophy. It’s such a wonderful achievement for this club to be in the position we are in, and we as supporters are enjoying it with you.